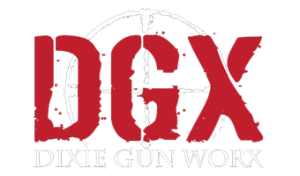 Owned and operated by Chris Michel since June 2010, Dixie Gunworx, located off of Sunset Boulevard in St. George, is a one-stop shop for all of your firearm needs. At DGX, our goal is to give you a more accurate, innovative, reliable and functional firearm at an affordable price. Your satisfaction is our priority, and is guaranteed for any purchase, or your money back. DGX specializes in building customized firearms; however we also do outstanding work in modifications and repair for your current firearms, and have a many impressive standard and custom firearms in stock that are ready for you to take home today. We can help you find, buy, sell, trade and transfer any firearm, or firearm accessory. With our friendly, and knowledgeable staff, and our extensive networks of manufacturers and dealers, we will work with you to find or create exactly what you are looking for. Stop by our shop, or visit our online store today to see what we can do for you.